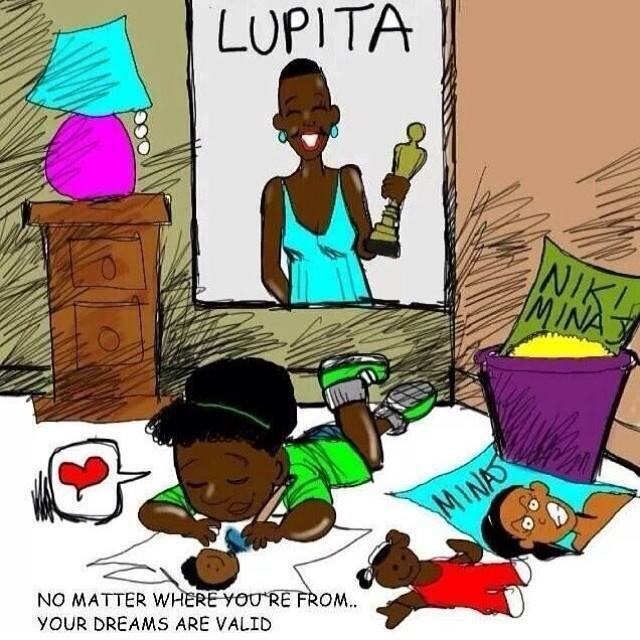 Hollywood, We Are Watching What You Do to Lupita Nyong’o. And What She Does to You. A very good article about the rise and triumph of Lupita Nyong’o in the context of white Hollywood and black/WOC actress systematic discrimination. I would argue about some points here and there, especially about the idea that Lupita, being a privileged black Kenyan, may be unself-conscious about (and kind of “free” from) the race dynamics in America. For race dynamics (and racism) can be experienced world wide, even in Africa. Lupita’s speech about being alienated due to colorism while growing up in Kenya is just one example of the many way race and racism impacted even on the most privileged of us. But overall this is a very insightful article which deals with the same arguments I made in my last Oscars post on Sunday. Très bon article (en anglais) sur le triomphe de Lupita (yeah!!!! ), les circonstances (surtout ses privilèges de classe) qui l’ont rendu possible et l’espoir mesuré ou du moins les attentes qu’il crée vis-à-vis d’un système hollywoodien où les actrices noires sont systématiquement doublement discriminées.